Thinking of selling your currency and/or foreign coins? Please...call us at 1-800-279-4337 and receive current real-time prices! SELLING ONLY TAKES A MOMENT OF YOUR TIME!...simply call us for current prices for the coin/s you wish to sell and upon your acceptance request a confirmation number which serves to confirm your transaction (your confirmation number also >>>locks-in<<< your prices). Then ship your coins FULLY INSURED VIA U.S. REGISTERED MAIL. Upon receipt, MJPM will call to confirm your shipments safe arrival and issue your check the same day! 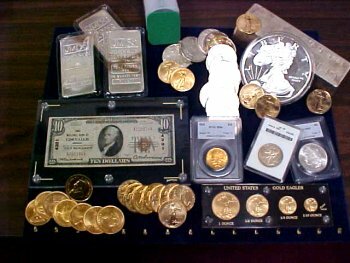 * You will discover MJPM to be extremely competitive on all gold, silver, platinum, and rare coins.